Four burner grills are serious grills, for people serious about grilling. A 4 burner is going to give you the space to grill for those large parties. I am talking Labor day, the fourth of July and if you are crazy enough to grill in Febuary…the Superbowl. The Final Sear: The Monument Stainless Steel 4 Burner is my favorite grill in this category. Packing 4 burners with 72K BTUs of cooking power and an impressive 513 sq. inches of cook area, this thing is a beast. The rotiesserie kit thrown in puts this grill over the top. It hits that sweet spot of price, durability and features. Choosing the right grill, particularly the right 4 burner isn’t simply a case of throwing money at the problem. 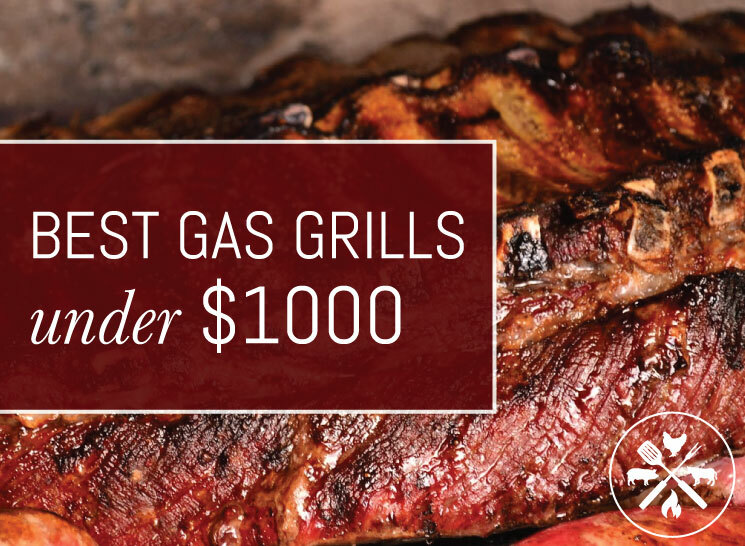 There are plenty of options out there for the discerning grillman but you need to know which ones are worth spending that little bit more of your hard earned cash on, and which ones are punching way above their weight. A four burner needs to do several things, and it needs to do them well. They should provide a good amount of direct and indirect heat exactly when and where you want it. They are also large enough that you can think about getting a rear rotisserie, side burner and even a sear station for those days you need a badass steak. Monument earns our top spot in the 4-burner category for designing a reasonably priced grill with a full feature list and an impressive amount of power. This grill bring the heat with the amount of VALUE you’re getting in terms of square inches, straight BTUs and the overall quality of the materials used. It’s less than half the price of the Weber and offers more power per square inch. The 17842 packs a serious punch. It is the most powerful grill in our top line up, with 72,000 BTUs for 4 burners and an additional infrared side burner for sauce or side prep. The total cook space is a very roomy 723 square inches, with 513 primary and 210 square inches of glorious warming rack. It comes in higher than the Char Broil on size and just short of the Weber. It is also well made, with all stainless steel housing and blue LED knob lighting for cooking in the dark. It also offers pilotless one button ignition for easy and reliable start-ups, porcelain-coated cast iron cooking grates and a built-in thermometer for precision temperature monitoring. Stainless steel flame tamers maintain even heat delivery for consistent cooking across the entire cook surface so all your steaks are cooked to a perfect medium. Monument also offers lots of prep space with 2 huge stainless steel side shelves outfitted with hooks for all your grill tools. The double door cart-style base offers additional storage and keeps the propane tank hidden from view. You’ll also enjoy a couple bonuses with this grill, including a built-in rotisserie kit AND motor so you can get serious about your grill game and take things to the next level. Weber has an industry dominating line-up of grills in the Genesis collection, with the 440 offering a 4-burner option with a great exterior design and solid feature list. The entire Genesis line offers Weber’s GS4 grilling system, a new component package comprised of core grilling necessities for the highest-quality grilling experience for both weekend warriors and everyday grill snobs. The GS4 set-up combines Weber’s infinity ignition system for fast, reliable start-ups, high performance burners, the signature flavorizer bars and a new, super efficient and easy grease management system to eliminate flare ups. The result is a finely tuned grilling experience that is smooth and reliable so grilling is always fun and the result is always ridiculously tasty. The 440 combines all of these features in a roomy 4 burner grill with 646 square inches of primary cooking space and a 198 square inch tuck-away warming rack for buns, sides and finished meat. Total power is 52,000 BTUs on the main burners plus an additional 12,000 on the lidded side burner. I’m a big fan of a side burner, they’re great for cooking up sauces or sautéing sides to complement the meat. At this price point and with 4 main burners they become more common and it’s a selling point you should always look for in this range. The Genesis line also comes iGrill3 ready, which means you can sync up your smart phone with your grill to remotely monitor temps using Weber’s app. A few other nice details features include a lighted handle bar on the main lid and lighted knob controls for grilling in low light conditions. This is a great grill if you’re looking for reliability and overall durability with a smart line-up of features. The Char-Broil is the least powerful and smallest of our top 3, but we love this grill for the super budget-friendly price tag and solid feature list. The Performance 475 offers 36,000 BTUs of total cooking power, with a nice 10,000 BTU lidded side burner for sauce or side prep, 475 square inches of primary cooking space and 175 square inches of warming rack, both with porcelain-coated cast iron cooking grates. The lid, handle and control panel are well made and constructed of stainless steel. The top-ported burners themselves are also made of stainless steel and designed for maximum longevity. You’ll find a lid-mounted thermometer and a removable grease pan for easy clean-up. The grease pan is also located with easy access so you’re not searching for it and struggling to get it out after each grilling experience. The metal side shelves are roomy and there’s a lower cart area for basic storage. Like the 5 burner version, it also includes electronic ignition. Out of all Webers – and they make some damn fine grills – I think I have finally decided that this is my favorite. There is something about the refined power of the Summit, I keep coming back to. I just love this grill. First of all, it’s hard to ignore its looks. This is the equivalent of having that Italian sports car sat on your drive. I am in the camp that believes the Europeans make better sports cars than us, but one thing I know we do better is grilling, and this baby is made right here in the US of A. Cooking on this, you almost expect it start playing the star spangled banner. I’m telling you, cooking on every one of its 650 square inches of grilling space is a joy. It is remarkably easy to control the heat, and there is a lot of heat. A LOT. If you haven’t cooked on one of these babies before, it will blow you away how much heat these things produce, and how quickly you can use it. That is the thing you will notice when you step up to your first proper grill. A lot of my buddies who have toiled away for years on sub-standard grills assume it’s the norm to be constantly fighting with flare ups, cold spots, irregular heating etc etc. You get a Summit in your yard and those days are gone. Quick, even heat all day long. A quick word on the Flavorizer bar system that Weber created and use on this grill. It is not a gimmick. The bars catch drippings from your cooking, and then smoke that back onto and around the food, creating a more intense flavor. It really does improve the taste of almost everything you’re likely to cook on one of these. Whenever I’m cooking on the Summit – it comes in both propane and natural gas versions – I always get the feeling that they have gone back to basics with this grill. They have just given you what you need to cook damn fine food on it, and I really don’t think they could have done anything better. There are some exciting features, but you get the feeling they are there for a reason, as opposed to just being thrown on there for the sake of it which unfortunately is too often the case now with the high end grills. Sear station, side burner, rear rotisserie… It has it all! The grill out handle lights on this are a very handy feature, and work very well. No more groping around trying to find that last burger you know you put on there. I am really struggling to come up with a negative about this grill. Yes, you will pay more for a Weber, but buying something cheap that will need replacing every 2 or 3 years is false economy. Why not get something you are going to live with and love for many many years to come? The Blackstone is a totally different style grill from our top 3. This is a restaurant grade griddle-style set-up with a massive flat top and cart base. With this grill, you’re getting 720 square inches of flat top cook space, perfect for grilling up burgers, a steak or even a stack of pancakes with a side of bacon. 4 adjustable heat zones from the 4 burners allow you to fine tune the grilling experience based on what you’re cooking and over what part of the grill. Total power comes in at 60,000 BTUs. Additional features include an easy to maneuver cart-style base, electronic push-button ignition, two side shelves with a built-in paper towel holder and a cutting board. Another Monument Grill grabbed our number 1 spot, but that was the version offered in stainless steel with the rotisserie kit. Monument also offers this grill in black, without the rotisserie for a lower price point. What I love about this grill from Royal Gourmet is it’s huge BUT it’s also portable. This is the perfect grill if you need to cook for a large gathering (think team picnic, church social, or tailgating party with a big friend group) and don’t want to spend your whole day slaving over a tiny two burner. It offers both a grill and griddle option over 584 square inches of total cooking space. 48,000 BTUs power four distinct cooking zones for maximum versatility and flexibility. It also has two fold-down side tables equipped with tool hooks and a bottle opener to give you additional working space. With this portable from Royal Gourmet, you’ll also enjoy the same easy push-button ignition used on their larger grills in addition to quality stainless steel burners. Dyno-Glo is always a favorite in any category, delivering reliable and consistent grills with solid feature lists and reasonable price tags. The DGE Series comes equipped with 52,000 BTUs of total cook power, 4 stainless steel commercial grade burners, as well as an optional side burner with 12,000 BTUs. It includes stainless steel cooking grates (not porcelain coated), as well as a stainless warming rack. The firebox is steel porcelain enameled and offers a generously sized 646 square inches of total cooking space. It also comes with electronic push-button ignition for a quick and easy start-up. Stainless steel heat tents protect the burners and help maintain even cooking temp across the grates. The side tables are stationery and do not fold down, so this grill isn’t a best pick if you are tight on space or will need to store your grill. Bull is one of our favorite grill brands for built-ins and if you’re not looking for a standalone this is a great 4 burner for your outdoor kitchen. The Outlaw also has a fairly attainable price point that isn’t beyond your average budget for a grill of this size. It comes equipped with 60,000 BTUs of overall power, a dual lighting system for getting up to temp quickly and easily, 4 stainless steel bar burners, and ReliaBULL technology designed by the geniuses at CalPoly to improve heat distribution and eliminate hot and cold pockets for ultimate grilling consistency. It also includes a smoker box, which is a really nice and welcome addition. Total cookspace is 810 square inches. This is a great budget grill if you’re looking to keep your purchase under $200, but still need a full 4 burner set-up. The RevoAce is surprisingly roomy at 480 square inches, which can accommodate about 28 burgers comfortably. It also has a 180 square inch warming rack for toasting those buns and porcelain-coated cast iron cooking grates. The stainless steel burners churn out about 48,000 BTUs and the stainless steel lid helps lock in heat for a consistent grilling experience. Additional features include a push-button ignition system, a lidded side burner, which is a great bonus for this price point, and two prep shelves.